The package was officially sold to the world as a success, but having a closer look, it’s easy to see it doesn’t do what it is suposed to do, and it does what it shouldn’t do. Climate scientists are advising us insistently: the world just has a few years to start acting on climate change, if not we may enter in an irreversible spiral of climate disaster. So the most urgent issue is to start acting NOW on real mitigation. Unfortunately, the Durban package doesn’t attend this at all. During the whole Durban negotiation, there hasn’t even been a real discussion on the issue. The reduction pledges by developed countries that are on the table, are still the same, totally insufficient, 13-17% reduction rates (from 1990 levels) since Copenhagen. Increasing the ambition is again postponed indefinitely. Inscribing those pledges in a legally binding Kyoto Protocol doesn’t change anything to the fact that those pledges will cook the world. Even developing countries pledged to do more than developed, but lack the financial and technological means to go beyond what they promised already. The other issue that is postponed since Copenhagen, and once again forwarded to discussions for next year, is the global goal. That is to say, how much should the world reduce its emissions by 2050? This longer term targets are essential if we want to stabilize the climate. Planning for it now is indispensable. But the numbers aren’t even being discussed. The carbon budget: a scientific concept that calculates how many emissions the world can afford to do, without surpassing dangerous limits. Unfortunately, most countries don’t see even the relevance of the concept. In order to decide how to share the burden, a set of criteria for the division of responsibilities has to be decided upon. Some key criteria should be: equity, population, historical emissions. But, developed countries don’t even want to talk about such criteria. So, without criteria for division of the burden, nobody actually wants to talk on the mitigation necessity. But, we can’t negotiate the carbon budget with Mother Earth: if we trespass it, she will act on us! Again, the world is left waiting for the real answers, while the questions at stake become more urgent year after year. Two basic principles, most valuable, embedded in the climate change convention, have always led the work up till know: the Science Principle, and the Equity Principle, which is known in negotiators jargon as “Common But Differentiated Responsabilities”. Both are being thrown away. Of course, nobody says the science principle will be disregarded. Indeed, there are several references to science and to the work of the IPCC, in the different texts. But was is the use of stating “keeping in mind science, I will do just the opposite science is requiering”? And that’s exactly what this decisions are doing. There no link between the mitigation targets and the scientific requirements. But worse, we are now openly accepting that during the whole decade, this link won’t be made. It is the reign of the “voluntary pledges”, at least up till 2020. Also equity is totally being undermined. An agreement to start negotiating an “agreed outcome with legal force” (probably a new Protocol), is forced upon developing countries, with the clear addition that it will be “applicable to all”. This contrasts strongly with all the previous decisions about climate change, which were always placed in the context of the ‘Common But Differentiated Responsabilities’. The agreement to negotiate a new legal outcome not only omits all references to it, it has been consciously taken out. Someone tweeted from the final plenary that the principle US negotiator reportedly said: “if equity is in, then the US is out”. It seems the US’ wishes are being considered as the future of the new climate regime. In the new climate regime, it seems the same legal commitment is being demanded from those who emit least as from those who emit most. Up till the moment, existing carbon markets have proven to be the worse idea for environment and equity. Just some elements out of long list fairly long list of why carbon markets don’t work: the essentially trespass emission rights from poorer countries (with low emissions per capita and needs to grow in order to lift population out of poverty) to richer countries (with high per capita emissions and desires of not diminishing their unsustainable lifestyle). By doing so, the originally projected emission growth in developing countries is locked in: or the emissions will take place in the developing country, or through offsets, in the developed. 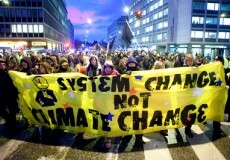 Worse is that there are so many problems with baselines, with projects that count for offsets but are not additional, with other environmental or human rights impacts, that carbon markets are regarded the biggest non-solution for the climate, and a collective lie to the public which is being told that in this way something is done. But, the bad plans always seem to have priority, and the carbon markets are high on the agenda of most governments. Before the conference, one could hear a lot more worry from the governments and corporations side on “positive signals for the carbon markets”, than on “improving the level of ambition.” One of the main reasons the Kyoto Protocol hasn’t been killed completely, is precisely that this was necessary for the stability of carbon markets, especially the European system. 1) In the “proposed amendment” on the KP, carbon markets are opened up for all parties, even for those that will not be a member of the second commitment period. Furthermore, the door is opened for “any new kind of market mechanism to be established under the convention” to be valid under the Kyoto scheme. 2) A separate discussion was made to include Carbon Capture and Storage (CCS) in the Clean Development Mechanisms. This technique provides the illusion that we can keep emitting, as the gases will be stored later on, while in fact their storage is at high danger to escape again to the atmosphere at some point of time. At the same time, the market units based on CCS will give more emission rights to those buying the offsets. * Only those who were used to deforest before, will now be compensated for not doing so! * As previous deforestation emissions are the baseline for offsetting units, which are essentially the transfer of emission rights, the previous emission rates will be just transferred to those buying the offsets. * The finance will only arrive after the results are proven, so, after several years! In the mean time, there are no funds to implement the policies that will lead to the reduced deforestation. As carbon market prices are very volatile, and with a severe tendency to crash, the final payment is not even secure. 4) There is a specific chapter (1bv) that now “defines a new market-based mechanism”, and establishes a work program to further implement them. This is a ball, that once it starts rolling, is very difficult to stop. The direction is a proliferation of all kinds of new market mechanisms.